Chinese Taipei, Japan and Korea have advanced to Super Round . 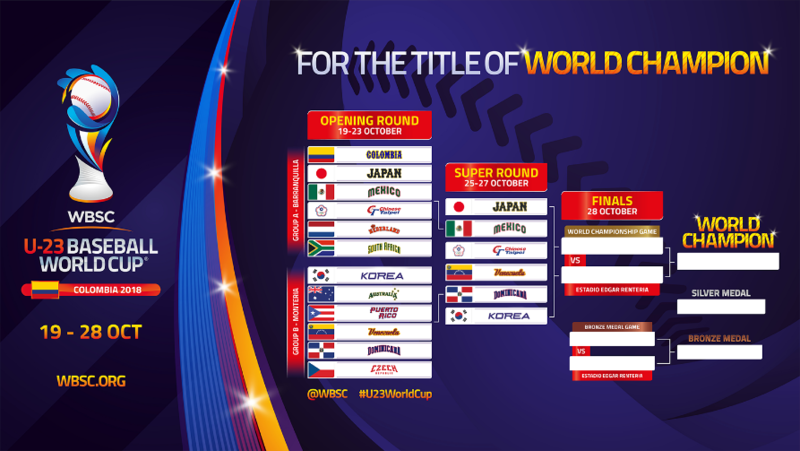 The World Baseball Softball Confederation today announced the Super Round schedule for the II WBSC U-23 Baseball World Cup 2018, following 30 exciting Opening Round games in Barranquilla and Monteria, Colombia. World No. 2 Japan, No. 6 Mexico and No. 5 Chinese Taipei claimed Group A's three available places in the Super Round. Defending U-23 World Champions Japan went undefeated (5-0) to win the Group, while Mexico (4-1) and Chinese Taipei (2-3) finished in second- and third-place, respectively. In Group B, No. 11 Venezuela, No. 12 Dominican Republic and No. 3 Republic of Korea have advanced to the Super Round. Venezuela swept the group in Monteria with a perfect 5-0 record, while Dominican Republic (3-2) and Korea (3-2) placed second and third. No. 7 Netherlands, No. 16 Colombia, and No. 26 South Africa from Group A and No. 8 Australia, No. 10 Puerto Rico and No. 18 Czech Republic from Group B will continue in the 7th-12th Place Round in Monteria. WBSC will live-stream all Super Round and 7th-12th Place Round games in English and Spanish for audiences worldwide at youtube.com/wbsc and facebook.com/wbsc. •	No. 3 Korea vs. No. 2 Japan at 10:00 a.m.
•	No. 5 Chinese Taipei vs. No. 12 Dominican Republic at 3:00 p.m.
•	No. 6 Mexico vs. No. 11 Venezuela at 8:00 p.m.
•	No. 5 Chinese Taipei vs. No. 3 Korea at 10:00 a.m.
•	No. 11 Venezuela vs. No. 2 Japan at 3:00 p.m.
•	No. 12 Dominican Republic vs. No. 6 Mexico at 6:30 p.m.
•	No. 12 Dominican Republic vs. No 2 Japan at 10:00 a.m.
•	No. 5 Chinese Taipei vs. No. 11 Venezuela at 3:00 p.m.
•	No. 3 Korea vs. No. 6 Mexico at 8:00 p.m.
Standings have been updated, removing all Opening Round games played against eliminated teams (only wins-losses among the Super Group opponents are factored into the standings). The top two finishers in the Super Round will play For the Title of World Champion on Sunday, 28 October at 7:00 p.m, while the 3rd and 4th Place finishers will battle in the bronze medal match at 1:00 p.m.
National Team rosters for the U-23 Baseball World Cup feature players within the organisations of the Australian Baseball League (ABL), Chinese Professional Baseball League (CPBL), Colombian Professional Baseball League (LCBP), Dominican Professional Baseball League (LIDOM), Korean Baseball Organization (KBO), Major League Baseball (MLB), Mexican Baseball League (LMB), Nippon Professional Baseball (NPB), Puerto Rico's Roberto Clemente Professional Baseball League (LBPRC) and the Venezuelan Professional Baseball League (LVBP), in addition to other leagues from around the world.